Obscure CanLit Mama: The week in suppers, with recipes! The week in suppers, with recipes! **Monday's menu: Baked fish. Baked squash. Gallo pinto. **Inspiration: Fish to feed a guest who has yet to like anything I've made for her. Luckily, she liked the fish. Unluckily, her best friend AppleApple can't stand fish. So for AppleApple, I made beans fried with rice, aka gallo pinto, which is the Nicaraguan term for this fast and easy leftover dish. Gallo pinto means painted rooster. Don't ask me why. Mini-recipe, Gallo Pinto: I start by frying onions and garlic in oil, adding a touch of cumin and coriander and salt. When the veggies are soft, I toss in the leftover cooked rice and break it up with a wooden spoon and get it all coated in oil. Last, I add the beans and some liquid, and heat, stirring often. Voila. Serve with tortilla chips, feta cheese, crema or sour cream or yogurt, and hot sauce. **Tuesday's menu. Dahl in the crockpot. Baked rice. Carrot bake. **Inspiration: Carrots rotting in crisper. But this carrot bake was a retro-bust. It called for milk, eggs, margarine (yes, margarine) and bread crumbs. I should have known better. It tasted about as good as it sounds. Next time I'll make a ginger-carrot soup. **Inspiration: Splurged on a new vegetarian crockpot cookbook. **The verdict: Crockpots prove good for making a vegetarian broth. (But I still like chicken broth better. Wah.) 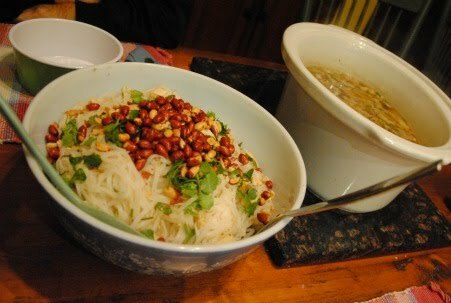 The pad thai recipe adapted from my Joy of Cooking uses no ketchup and lots of fish sauce. It's pretty legit. Bonus recipe, No-Ketchup Pad Thai: Cook a package of rice noodles, drain, and set aside. Meanwhile, do your prep work. Chop green onions and 2 cloves of garlic and set aside. Chop a block of tofu into nice little squares (optional); if you want to get fancy, toss tofu with a mixture of 1 tsp cornstarch and 1 tsp sesame oil; set aside. In a small bowl, stir together 1/4 cup fish sauce, the juice of one lemon, and 3 tbsp sugar. Beat three eggs in a small bowl. Have ready: 1/3 cup chopped peanuts, a pile of chopped cilantro and basil (if available). Heat oil in wok (amount of oil at your discretion). Begin by frying onion and garlic and toss in some hot pepper flakes if you'd like. Add and fry tofu until crispy. Add and fry eggs until scrambled. Add cooked noodles and pour fish sauce mixture over top. Stir until coated. Remove from heat, place in serving dish, and top with cilantro and peanuts. **Thursday's menu: Egg fried rice and warmed-up hot pot. **Inspiration: Leftover rice. Home late from volleyball game after school. In a hurry. **The verdict: Quick and dirty. Skipped the tofu after a request from my eldest. Added eggs for protein. I love my wok. **Friday's menu: Send children to CJ's nursery school's "date night" fundraiser for pizza and snacks. Send selves to fancy restaurant for something much tastier. Start selling contents of attic on ebay in order to afford the extravagance. **Weekend kitchen accomplishments: 4 litres of yogurt; waffles (to eat, plus some to freeze); 8 loaves of bread; double batch of double chocolate cookie squares. Those cookie squares are really good and deserve a recipe-posting too. Remind me later. I considered this the kick-off to my holiday baking.